After a few weeks without internet (or a kitchen), I am so happy to post another favorite recipe. I just moved and am beyond excited! And sweetening the whole experience is my beautiful new kitchen! 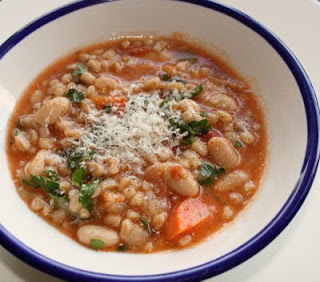 The first recipe I made when I moved in was Farro Minestrone Soup. After moving, we needed something comforting and nourishing to feed our aching selves. I have always loved to make minestrone. I replaced the pasta with farro a few years ago, once I heard that it was low in gluten and good for those with wheat sensitivities (please substitute the farro in this recipe with another grain if you have Celiac Disease). While researching farro, I found that it is the original grain from which all others derive! Wow. It has fed the Mediterranean and Near Eastern populations for thousands of years. Farro should be soaked to optimize digestion and it lends a wonderful chewy, firm texture to this soup. Farro has its outer bran and germ layers intact, which are full of nutrients such as folate, vitamin E, potassium and fiber. I add a parmesan rind to this soup during cooking. It thickens it in a lovely way and imparts a rich, nutty texture. I keep leftover parmesan rinds in the freezer and simply pop them in soup when needed. Soak farro in water for two hours. Drain farro and rinse. Heat oil in a large stockpot over medium heat. Add the onion, celery, carrots and some salt and pepper. Cook until the onion is softened, 5 to 10 minutes. Add garlic, and cook until fragrant. Add farro, tomatoes, bay leaf, thyme sprigs, parmesan rind and stock/water and stir to combine. Bring to a boil, then adjust heat to a steady simmer. Cook for about an hour , stirring periodically. If the soup is too thick from the farro absorbing the liquid, add more stock or a little water. Add white beans and cook 15 minutes more. Stir in parsley and then cook another 5 minutes. Remove bay leaf and thyme and add sea salt and pepper to taste. Serve warm with lots of parmesan, a sprinkle of parsley and a drizzle of good quality olive oil. I think this soup is much better the next day as the flavors continue to meld overnight. However, when storing the soup the farro will continue to absorb the liquid it’s in. Be prepared to add some water or stock to thin it out when re-heating. Enjoy! OO! Minestrone is one of my all time favorite soups! I have never had farro though, where do you get it?? You can get it at Whole Foods, health food stores, Italian markets and specialty food stores. You can always substitute barley or your favorite grain. I love minestrone soup. It is a very healthy and nutritious soup. I haven't tried the farro yet. Must go and look for it. Thanks for sharing. Farro has such an amazing flavor. Your soup is a great way to use it! I've never cooked with farro before but this looks like something i would love to try! Gorgeous pics! Oh I love minestrone – it's my favorite kind of soup! Yours looks absolutely delicious! The soup looks great and wholesome! It's perfect for the unusually cold weather we've been having! congrats on the move! this soup looks wonderful! Love this recipe! I've been wanting to make farro after having it as a side dish at a local restaurant and soup would be perfect for the season! I've never made farro before and now you've just inspired me! Minestrone with farro sounds fantastic! Would really be nice on a cold day like today! Yum. I can't wait to try this recipe! I love the use of farro. I've never heard of farro before, very interesting. Your soup is making me hungry, it looks wonderful! Hope you are very happy in your new place! This is just the sort of soup I love, so nice. I'm so cold right now, this soup sounds like just the thing I need! I've never used farro in minestrone before but I'm definitely going to try it. I have never used Farro, this is a new ingredient for me, but it sure looks similar to barley. Monique and I just ate some Minestrone soup at a local Italian restaurant this past week, and yours looks so much better than the one we had. Ooh I love how tasty this looks! Sounds great. Love the Parmagiano in the soup during cooking – I do that too, it adds a ton of flavor. Also love the use of farro. There are so many grains out there and thankfully we, in the US, are starting to use a lot more. This is a good reminder for me to give farro a try. I've been wanting to incorporate it in something, as I've been seeing it pop up everywhere on menus, plus I do love whole grains! Thank you everyone–for the great comments and best wishes for my new home! I love minestrone soup with beans wow I GONNA ENJOY THIS. I LOVE this recipe! Farro is a wonderful whole grain. Great job! Your soup looks so inviting! And looking forward to see your new kitchen. Cheers! Farro is a great addition to Minestrone Soup, adding texture and so much flavor! Congratulations on your new kitchen! I've been hearing more about farro recently, so this is definitely something I am curious about trying. The soup looks great! Congratulations on your new kitchen. I'm in love with these kind of soups. Simple, heart but still full of flavor and interesting textures.